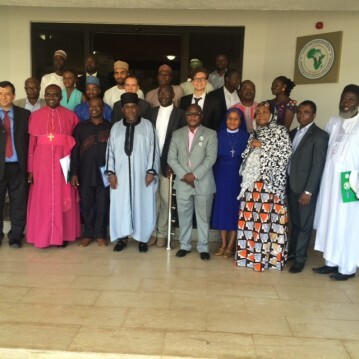 A delegation from International Dialogue Centre (KAICIID) visited Nigeria to search for opportunities to expand its involvement in peace building in the country through the use of inter-religious dialogue. The delegation – led by KAICIID Deputy Secretary General for External Relations, Ambassador Alvaro Albacete, and Senior Adviser, Professor Mohammed Abu-Nimer, with Ambassador Yahaya Lawal and Dr. Dodik Ariyanto from the Organisation of Islamic Cooperation – met with more than 20 senior religious leaders, government officials and civil society representatives during a week-long trip to Abuja. The trip was organized with the assistance the Organization of Islamic Cooperation (OIC) and KAICIID’s local partner, the Institute for Peace and Conflict Resolution (IPCR). Ambassador Albacete said that KAICIID aims to work with international and civil society partners to support interreligious dialogue in Nigeria. “We had a very promising visit to Abuja and discussed a number of areas where we think the Centre will be able to assist. We expect to make an announcement about these initiatives very soon,” he said. Nigeria is currently battling militant group Boko Haram and faces increased tensions between Christians and Muslims, as well as along tribal lines. The country has almost equally large Christian and Muslim populations, which are also regionally demarcated. Speaking generally, Christianity is widely practised in the southern part of the country, and Islam is the majority religion in the north. In a meeting with the KAICIID delegation, the Cardinal of Abuja, his Eminence John Onaiyekan, explained the tensions between the religions in Nigeria and the urgent need for dialogue. He said that his hope was for Nigerians to look beyond Boko Haram being Muslim and see it as a threat for the whole country, regardless of any affiliations. Ambassador Albacete said KAICIID is committed to working with the religious leaders in Nigeria to ensure that these strengths can be used to best effect. “Nigeria has suffered greatly due to violence by those seeking to manipulate religion. But it also has an ethnically and religiously diverse population, and engaged religious leaders who have been working together for peace. There are great strengths in the campaign against violent extremism,” he said. Widespread poverty has been cited by (inter) religious actors in Nigeria as major concern for the cohesion of society and local communities. KAICIID and its partners are committed to implement short and long term activities to support the field of interreligious dialogue and to contribute to peace and social cohesion in Nigeria. In a separate, but linked initiative, KAICIID is working with the Network for Religious and Traditional Peacemakers to conduct a study that examines why people are attracted to the recruitment tactics of extremists groups like Boko Haram.